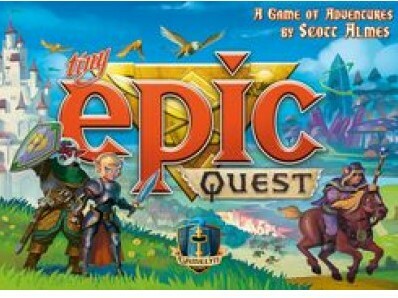 In Tiny Epic Quest, players embark on a sandbox adventure. Each player controls a band of three elf heroes questing to save the world and the sacred mushroom folk from the intruding goblins. Each round is broken into two phases: day and night. During the day, players travel far and wide, visiting villages to acquire quests, monuments to learn powerful spells, mushroom groves to seek guidance, and treacherous locations in search of artifacts! Acquiring artifacts empower the heroes with unique abilities, this may improve a heroes' movement or combat, or their ability to learn spells or mitigate harmful dice rolls. Heroes must travel by foot, by horse, by raft, by boat and by gryphon to get to everywhere they need to go to satisfy their quests — or to position themselves for what night brings. As each type of movement is different, and limited, players need to take careful consideration when traveling, and how they travel, if they wish to accomplish all of their goals. During the night, players must face the challenge of their quests, and decisions, by rolling dice, hoping for fortune, and knowing when to quit. Will you press on? Or is it time to save your progress and rest? Tomorrow is another day.